Offer only valid to mailing recipients. We will estimate your project for FREE using our standard estimating method. Then we’ll discount 10%. We do not upcharge you on your estimate to account for the 10%. Offer is valid on GAF’s line of residential, asphalt/laminate architectural shingles available in our region. This includes the Timberline High Definition shingle with StainGuard, one of the most (if not the) most popular shingle in the United States. Or upgrade to an energy-efficient or premium designer shingle. It’s your choice! 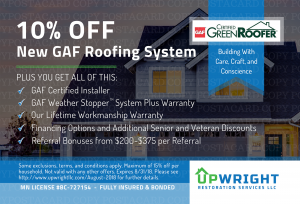 System will include GAF accessories and will be installed per the manufacturer’s instructions in order to achieve GAF’s Weather Stopper System Plus Warranty. This includes GAF starter shingles, hip and ridge cap shingles, ice and water protection, and synthetic underlayment. If your project is the result of an insurance claim, restrictions may apply due to your claim adjustment paperwork. Please contact us for additional details. Offer is valid for contracts signed by August 31, 2018. Work must be completed by November 30, 2018.